Do you adore ghastliness? Are you a fan of the horrid? If you said “yes” to these questions, these nonfiction picks will appeal to your ghoulish nature. Chosen for their revolting subject matter, they are sure to disgust you. The Hot Zone by Richard Preston- A thriller of science “fact” that explains gruesome filoviruses and the sickening things they do to humans and monkeys before they kill them. Brain sludge, anyone? Stiff: the curious lives of human cadavers by Mary Roach-Fun facts about corpses and their afterlives. 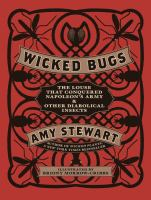 Wicked bugs: the louse that conquered Napoleon’s army & other diabolical insects by Amy Stewart-Bug-phobic folks, beware. For more shivers of revulsion, check out this list. Hot Zone and Stiff are both great reads for readers who don’t usually like nonfiction. Now, I’ll have to try Wicked Bugs.